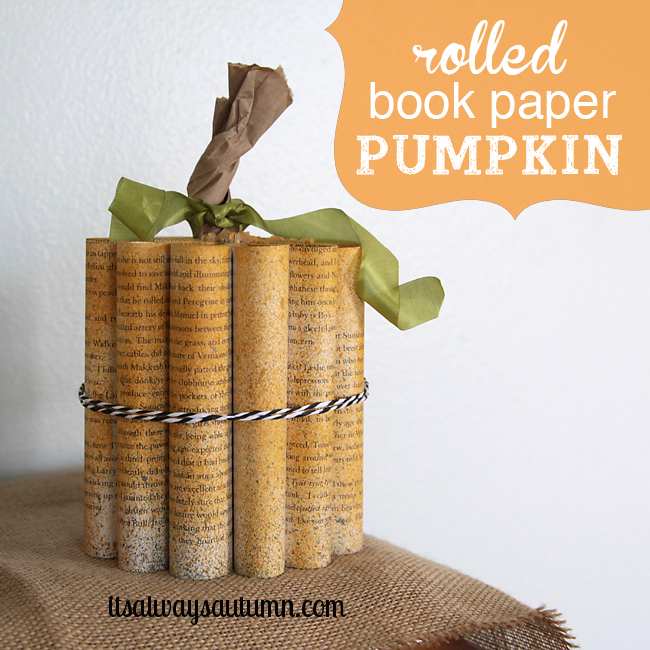 I’ve seen quite a few pumpkins made from old books around blogland, and I love them. 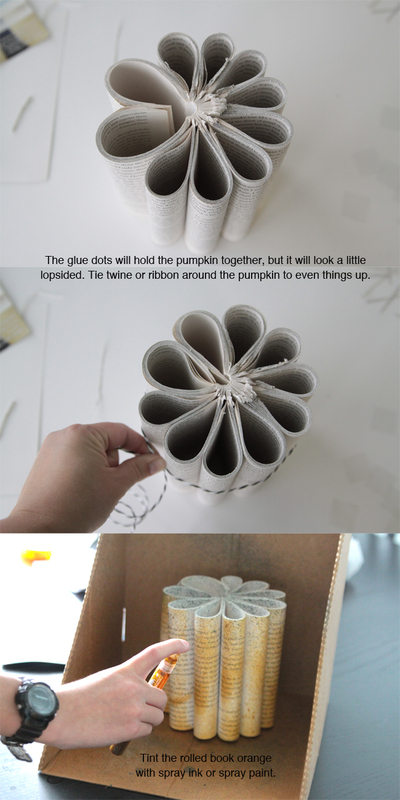 I wanted to put a new spin on the idea, so I created this rolled book paper pumpkin, based on some rolled book flowers I saw on pinterest (the pin no longer links to a tutorial; otherwise I’d link back). I’m aware my version doesn’t look exactly like a pumpkin, but I think it’s pretty cool anyway. Keep reading for step-by-step photos! 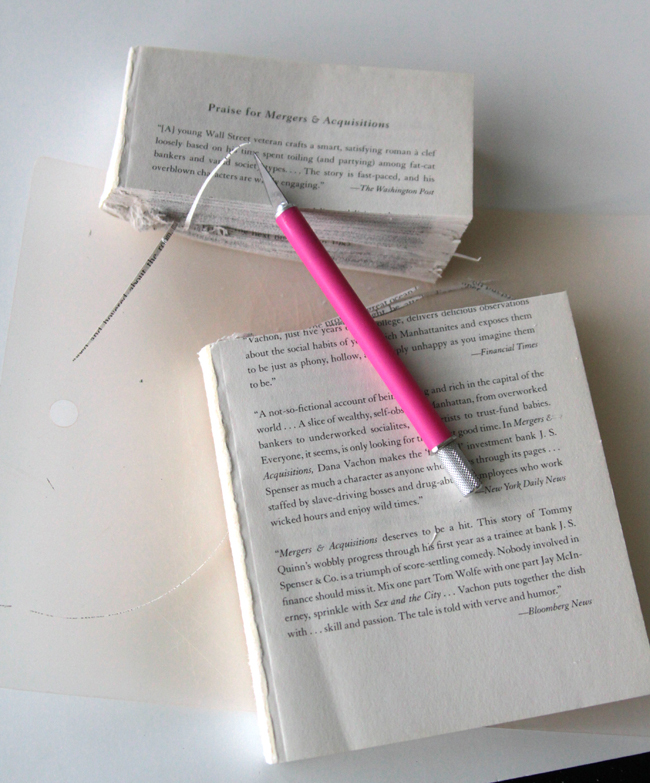 I bought a paperback book from the dollar store (you can often find old books at the library for a quarter), and ripped off the front and back covers. I also used an exacto to cut the top off and make it a little shorter – otherwise I would have had a very tall, skinny pumpkin. I used orange spray ink to lightly coat the pumpkin, and added just a little dark green spray ink along the bottom. I made a stem by twisting up half a brown lunch sack and then securing it to the center of the pumpkin with a few more glue dots. Green ribbon finishes it off. It didn’t take very long to make and only cost me a buck: my kind of craft. Really cute! Definitely going to make it this weekend! Thanks for the tutorial. This is defiantly a different spin on the book pumpkins in Blogland. I LOVE this! Pinning it now. Stopping by from the Link Party Palooza! Have a wonderful night! I just love how creative! what some paint and glitter can do! cute! This is gorgeous! Unbelievably clever! Stopping by from Hoyby Crafts. Newest follower! That is the most original pumpkin I’ve seen and I love it! How creative! This is adorable I’d keep up this up year round. Thanks for sharing!